First browse the forum some, in case the item has already been brought up. If the item has been mentioned, then you can just reply with something like, "This bug affects me too" or "This feature would help me too." a. A bug is reported or a feature is requested. b. The program is updated accordingly. c. Someone adds a reply to the forum topic, causing the topic to go to the top of the list (because topics are sorted by most recent reply date). d. People assume the topic applies to the current program version, because they don't notice the date the topic was started; again, this problem scenario can be avoided by listing the SMath Studio application version in your posting. This will help you to catch mistakes, or clarify unclear statements you make, before other people see them. 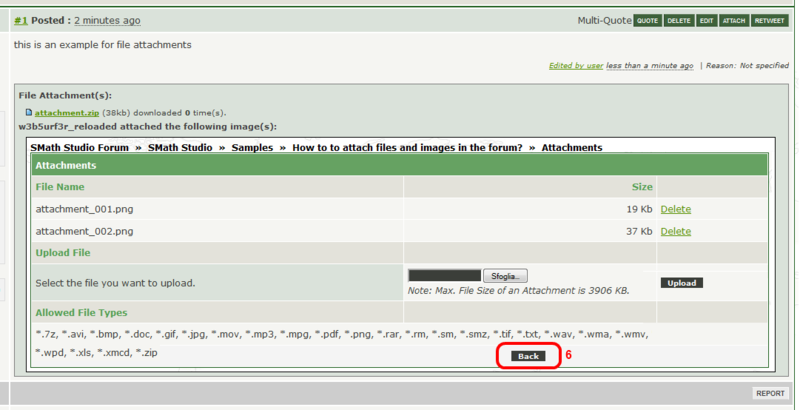 There are two reccomended ways to attach files and images to the forum. Some people have considered using 3rd-party free file-hosting services for storing forum attachments. These services usually delete the files automatically after some time, however. Instead, attachments to forum postings should not expire until the author of the posting deletes them and deletes any links to them. So the Wiki is preferable for storing forum files. SMath Studio expressions are shown directly in the posting, but are stored only in the text of your posting itself, by means of forum markup code (see Copying-and-pasting an Expression from SMath Studio to the Forum). The following sections explain how to include these 3 kinds of non-text material in a forum posting. attachments are shown as a link that a reader can click on to download them. Once you select that option, you will be presented with a Wiki login page if you aren't already logged in. Logging in requires an account on the Wiki. On the login page, you will be given the option to start an account if you don't have such an account yet. Then, preferably, make a subfolder for your files, so that at any time later on, you can quickly tell which files are yours. Please be considerate of others who store files on the Wiki. 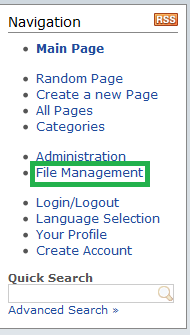 Please consider to use forum_attach/ as your folder for forum attachments and leave other folders for WIKI purposes. Please delete your files from the Wiki once they are no longer needed on the forum. Also delete the links to these files from your forum posting, if the posting has not already been automatically 'pruned.'. *.sm files cannot be uploaded to the Wiki directly - therefore please archive *.sm files into *.zip format instead. Files should not have apostrophes (') in their names. If they do, then if you want to rename them, you won't be able to do so using the Wiki's File Management screens; to rename the files, you will have to delete them and re-upload them with the new names. The full URL is used with forum code to include the picture or attachment in your posting. Options for doing this are described next. 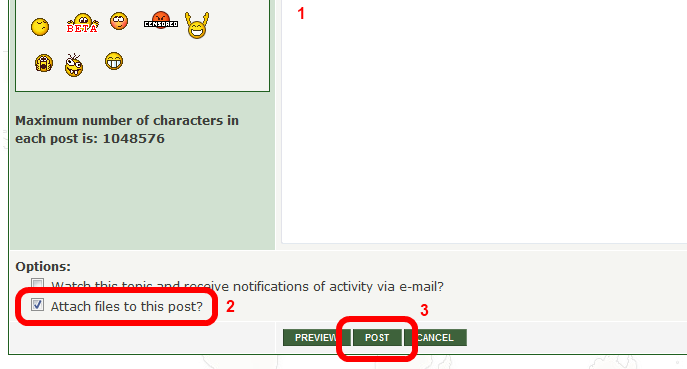 You can use the toolbar buttons, just above the forum text-entry box, to insert forum code for you. Or you can type the code by hand if you insist. The following code examples are given to help you understand how the forum code works, in case some code that you insert via the toolbar doesn't produce the result you expect. You can change the %2f (or other similar codes you may see) to their normal representation if you want ('/' in this case - without the ' ' tick marks, of course). People's web browsers will access the file either way. Through the clipboard you can share any individual math expression from the SMath Studio application by using the MATH forum tag. (You cannot copy multiple expressions at one time, but you can include multiple expressions in your forum posting by copying them one at a time and using a separate MATH tag for each.) Please take a look at the screenshots below. Figure 1: Using MATH tag of the SMath Studio forum. Now let's discuss copying the expression itself from SMath Studio. Figure 2: Wrong selection method for pasting an expression into forum. Figure 3: The first step in selecting an expression for copy-and-paste. Figure 4: The second step in selecting an expression for copy-and-paste. Figure 5: Copying an expression to the forum via standard system clipboard. Note: Each time someone views your forum posting, the expression is converted from text format to picture format by a Web service that's hosted on the smath.info website. This Web service interprets the character ';' as a function arguments delimiter and ',' as a decimal symbol. If your locale settings are different than these, then the text formatting that is produced when you copy the expression from your SMath Studio will be incompatible with the mentioned Web service. You can easily avoid this problem, as described next. Figure 6: Expressions as-localized in SMath Studio. Figure 7: Expression pasted into forum per locale of author of posting. Figure 8: Expression rendered per locale of smath.info. Figure 9: Expression edited for locale. Figure 10: Expression successfully shown in forum. Figure 11: Expression pasted into forum per locale of author of posting. will be presented as expected. Figure 12: Expression successfully shown in forum. Without lang=* then lang=rus is considered and ';' and ',' are used as argument separator and decimal symbol respectively.